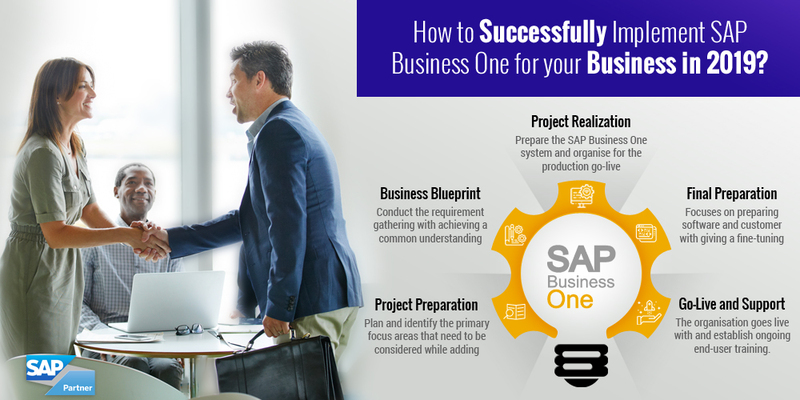 Whether you’re new or long-time SAP Business One user, SAP Business One installation will give you a plan to streamline your SAP Business one project with ease. If we look at the SAP Business One projects, then it comes in various shape and sizes. The SAP consultant team is ready to share their stories on how to satisfy the customer for new SAP Business One Installation. If you’re implementing SAP in your business, then start building your corporate journey based on internal approval followed by identification partner. Everything, that matter is you need to get a chance to handle the critical situation and to have a direct impact on the outcome of the project. There are lots of things you need to consider while at the early stage to streamline the business. Why not have a look at some of its necessities. • Project Preparation: Plan and identify the primary focus areas that need to be considered while adding technical issues and taking care of project management topics. • Business Blueprint: Conduct the requirement gathering with achieving a common understanding to run SAP B1. Define and analyse business process with revising the overall project schedule. • Project Realization: Prepare the SAP Business One system and organise for the production go-live. Complete the user training with making necessary adjustments. • Final Preparation: This phase mainly focuses on preparing software and customer with giving a fine-tuning of that tool. Using this one can get complete cutover activities for going live. • Go-Live and Support: This is the ultimate goal where the organisation goes live with and establish ongoing end-user training. Proper management plans are made to improve business processes. • What’s your partner’s technical expertise, what do they offer? To carry out the global operations and to use the experienced consultant we give a faster response to our customer to enhance the SAP Business One performance. • Do you have a sort of knowledge about your prospective partner? Does your partner keep track of your financials, do they streamline the sales process and implement them. Silver Touch does all this with managing it effectively. • Does your competitive partner have experienced team? The SAP team should mainly focus on the main significance capabilities on delivering the real world projects with targeting the new practicality and analytics skills. We have that expertise that can offer you the best. • How good is your partner with the post-implementation support? Silver touch believes in customer satisfaction which is a key to success as this is the challenges for any partner’s company to compete with. • What extra things your other SAP Solutions Provider offers? Does the company offer SAP cloud solutions, Mobility solutions, support service and other custom solutions? We do deliver all with complete SAP Business Solutions. • Is the partner company is flexible and adaptive? The partner company should deliver enhance business functions by taking care of various add-ons. With Silver Touch, you’ll get a chance to use all deployment services with ease. • Is your product fit for the customisation? Does customisation possible on SAP solution like any custom app development and integration? SAP Business One comes with SDK kit for enhancements and customisation as per the client and industry requirements. SAP Business one application comes with an affordable and comprehensive solution for managing the entire business by using streamline operations. Some of which are useful in getting timely and complete information with accelerating highest growth. Let a look to a few of them. Complete: Get complete visibility with better control to run your end-to-end business process professionally. Integrated: All business functions are settled in one package, and the possible standard integration is in an open application programming interface. Extensive: Use a flexible platform which allows growth for innovating and providing horizontal solutions with the help of SAP solutions provider. Innovative: We offer real-time data solution to get access to the ground and stay ahead of the competition with breaking technology’s needs. Affordable: Starting from basic we have few users that adds software implementation at low cost with limited capacity and cloud solution as demanded. We know that making a decision is very crucial for opting SAP Business One implementation. If you have any query related SAP Business One and want to leverage technologies for successful implementation, then get in touch with us. We help you to develop a next-generation platform for digital insights. Silver Touch UK always follows the standard implementation methodology for successful implementation. Get your free SAP Business One demo and share your business needs with us to understand the right business tools. Or you can contact us today on +44 – (0) 203-872-5140 or Send Email to info@silvertouchtech.co.uk to find out more.